I wanted to take a moment and draw your attention to a monumental event that is happening soon. On the 22nd of August until the 26th of August, in fact. It’s called the Whirlwind Social Media Tour. Novel Publicity has teamed up with Terri G. Long to bring you this lovely event and I get to be a proud sponsor for it. I’m so excited for this event and hope that each and every one of you can make it the best it can be. Below you’ll find more information about the coming event. I look forward to hearing from you and hope that we can make this event a grand success. Thank you so very much for being a part of it with us. 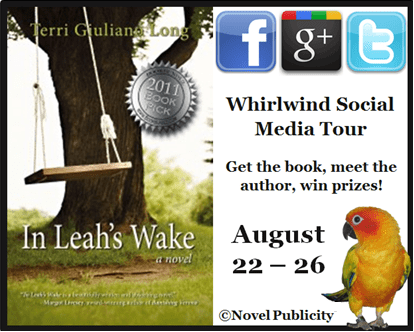 Announcing the In Leah’s Wake Social Media Whirlwind Tour — WooHoo! As part of this special promotional extravaganza sponsored by Novel Publicity, the price of the In Leah’s Wake Kindle edition has dropped to just 99 cents this week. What’s more, by purchasing this fantastic book at an incredibly low price, you can enter to win many awesome prizes, including a Kindle, 5 autographed copies of the book, and multiple Amazon gift cards (1 for $100, 3 for $25, 5 for $10, and 10 for $5 – 19 in all)! Be sure to enter before the end of the day on Friday, August 26th, so you don’t miss out. Purchase your copy of In Leah’s Wake for just 99 cents. Fill-out the form on the author’s site to enter for prizes. Monday, August 22nd – Blogaganza on Novel Publicity! We’re kicking-off on the Novel Publicity Free Advice blog. We’ll ask the writer 5 fun and random questions to get everyone talking. Leave a comment or question in response to the post, and you may win an autographed copy of In Leah’s Wake. Don’t forget to visit the author’s blog to enter for the other prizes! Tuesday, August 23rd – Twitter chat with the author! Tweet with us between 4 and 5 PM Eastern Time, using the hashtag #emlyn. We’ll be talking with the author about her favorite books and best writing advice. Bring your questions about In Leah’s Wake and don’t forget to use #emlyn or to follow Terri @tglong. By joining in the tweet chat at the designated time, you may win an autographed copy of In Leah’s Wake. Don’t forget to visit the author’s blog to enter for the other prizes! Wednesday, August 24th – Google+ video chat with the author! Join our hangout between 12 and 3 PM Eastern Time to talk with the author and us via video chat. We’ll be gabbing about great books including In Leah’s Wake and about writing. Did you know that Terri is a creative writing instructor at Boston College? She’s got tons of good advice for aspiring writers. By joining in the Google+ video chat at the designated time, you may win an autographed copy of In Leah’s Wake. Don’t forget to visit the author’s blog to enter for the other prizes! Thursday, August 25th – Facebook interview with the author! Stop by Novel Publicity’s Facebook page and ask Terri questions. She’s chosen three of her favorite topics to talk about: writing, parenting, and gourmet cooking. Of course, you’re welcome to ask about In Leah’s Wake too. Leave a comment or question as part of the thread, and you may win an autographed copy of In Leah’s Wake. Don’t forget to like Terri’s Facebook page or to visit her blog to enter for the other prizes! Friday, August 26th – Fun & games based on the book! We want to close this whirlwind social media tour with a gigantic bang, which is why we’ve set-up two interactive book-themed features on the author’s blog. You can take the official Facebook quiz to find out which In Leah’s Wake character is most like you and learn how that character ties into the story. Then try out our crossroads story game. Throughout the course of the narrative, you’ll have several decisions to make. What you choose will affect the outcome of the story. Play as either rebellious teenager Leah or the trampled peacemaker and mother Zoe. Leave a comment or question on any of Terri’s blog entries, and you may win an autographed copy of In Leah’s Wake. Don’t forget to check out the other give-away contests while you’re on Terri’s blog! This entry was posted in 99 Cents, Best Seller For A Day, EBook, Media, Network, Promotion, Social, Tour and tagged Authors, Indie, Indie Author's, Media, Novel, Novel Publicity, Publicity, Social, Terri G. Long, Tour, Whirlwind, Whirlwind Social Media Tour by LizzieBeth. Bookmark the permalink. Thank you so very much for sponsoring me, LizzieBeth! I love chatting with you on Twitter and so appreciate your doing this for me! It’s such an honor to be here! Thank you so very, very much!! Welcome always, Terri. It’s a pleasure. I’ve tomorrow’s post already prepared. Looking forward to unveiling it tomorrow morning and give you more exposure. I hope the event goes very well.